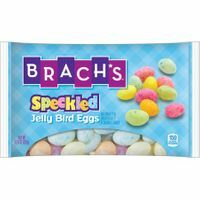 Brach's speckled Jelly Beans are also called jelly bird eggs. Each bag of speckled eggs are pastel in color. These come in six fruity flavors. Lemon, Blue Raspberry, Orange, Grape, Lime and Raspberry.